Driving off-road is serious business, requiring the right vehicle and tyres to get the job done. If you’ve got a 4×4, you’re already halfway there, but you’ll need to invest in some specialised tyres to ensure that you remain safe behind the wheel. 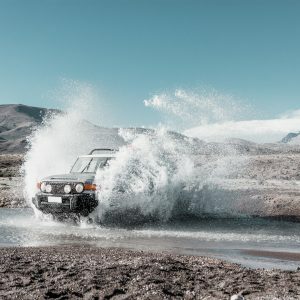 You don’t want to get stuck in the middle of nowhere due to a puncture on a standard road tyre, so it’s best to look for an off-road alternative if you’re planning a trip up a lonely mountain. Dunlop is known for innovative tyre technology, especially when it comes to their off-road variants. Combining their asymmetric tread design with an aim for all-terrain performance, they often receive reviews that show high rates of customer satisfaction. Because of this, they’re favourites on 4×4 vehicles throughout the UK. The Grandtrek range of tyres aims to suit every off-road 4×4 driver. Dunlop has created a tyre for every preference, whether you’re driving through sand in the summer or braving chilly conditions in the winter. Each option is built to last, often offering great performance on dirt and gravel. Many drivers swear by this brand, and for good reason. For all-terrain performance, look no further than the Grandtrek AT3. Your 4×4 will grip both on and off-road surfaces with this tyre, which makes it ideal for heavy-duty 4x4s, such as the Ford Ranger or Jeep Grand Cherokee. It possesses a straight centre rib that aids with speed and stability, while its flatter tread profile ensures that it is built to last. It also has Hybrid Overlay Technology in the form of a Jointless Belt, which reduces circumferential deformations at high speeds. As a byproduct of this, it also boasts improved stability at high speeds too, which is a benefit that both on and off-road drivers would appreciate. If gravel and dirt roads are a common occurrence during your daily routine, you should think about the Grandtrek AT2. With great performance, low levels of noise and excellence on wet surfaces, this tyre is an often-cheaper alternative its successor, the AT3. Its all-terrain tread provides reliable handling on gravel and efficient drainage in harsh weather conditions too. You’ll conquer dirt tracks and trails with this tyre, as the specific bead seat system strengthens the link between the tyre and rim. This results in a precise driving experience, with control over those tricky turns and bumps. While this tyre has been improved with the AT3, it should still be a contender for your 4×4, especially if you’re a regular on the slopes. High-performance SUVs need specialised tyres, and the Grandtek Touring A/S tyre ensures a safe journey. While not an off-road tyre, it effectively battles the elements, providing great performance and grip in both summer and winter temperatures. Your vehicle will also benefit from an enhanced grip during corners, due to the stiff shoulder area of the tyre. This tyre works best on muddy and grassy areas, though it tackles every element with determination. It’s an all-season tyre that works well on roads, so it’s a great option if you occasionally have to travel across uneven surfaces in your SUV. Tyres aren’t the only thing you need to consider when driving off-road. You also need to change your driving style to match the area that you’re in. Surfaces such as deep mud or sand may require momentum to pass through, rather than acceleration. On the other hand, rough terrain requires gentle acceleration and braking to avoid damage to your vehicle. There’s also water, which requires planning and judgement to cross, so make sure you’re clued up on the dangers before you begin your journey. We have a large range of Dunlop tyres on our website, including the models listed above. If you can’t find the option that you’re looking for, just contact our friendly customer services team. Our specialists strive to provide the widest range of high-quality tyres at competative prices. Simply enter your registration to find the right tyres for your vehicle.